Watermelons are a fantastic fruit for the summers. Many people believe that they can only help in preventing dehydration since they are made up of 92% water, but this is only half the truth. They are not just good at helping you beat the heat during the hot summer months; they also contain nourishing nutrients. Keeps the Heart Fit – One portion of watermelon a day can help in cutting down the level of LDL cholesterol in the body. By doing so, they can help in preventing cardiovascular diseases. Controls the Blood Sugar Level – Watermelons have a positive effect on blood sugar level. It can keep blood sugar at a low level and prevent it from spiking, a condition that can prove to be very harmful to diabetics. Protects your Eyesight – The carotene in watermelons help in protecting the macula layer of the retina. This can prevent blurring of vision. Helps Shed Excess Weight – The fibrous nature of watermelons helps in satisfying an untimely urge to snack without adding too much to the calorie intake. Helps Fight Inflammation – Watermelon can help reduce pain and swelling by bringing down the level of oxidative stress. 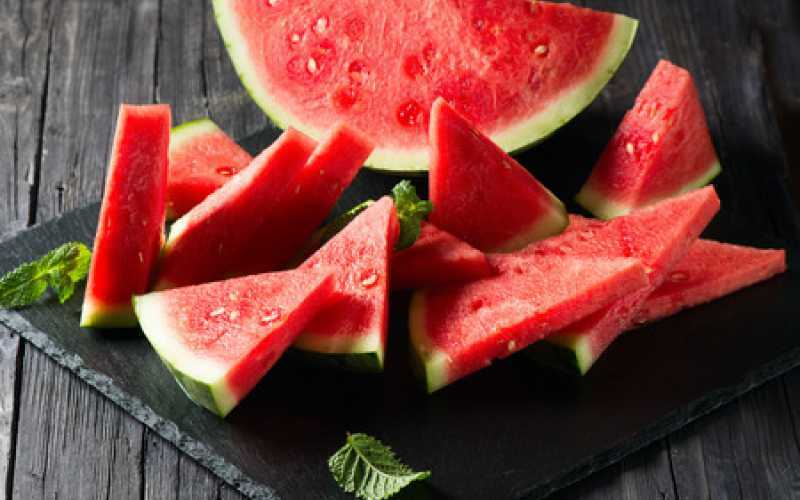 Relaxes Sore Muscles – Watermelon is great for athletes and sportspeople because it contains L-citrulline that can soothe aching muscles after an intense workout or a rigorous game. Prevents High Blood Pressure – Watermelon contains certain compounds like that make blood vessels function better. This can help in keeping blood pressure in check. Maintains Good Arterial Health – The carotene present in watermelon helps in keeping arteries and veins flexible. This ensures healthy blood circulation. Helps in Keeping the Skin Healthy – Watermelons can help in keeping the skin hydrated. A well-hydrated skin stays healthier and hassle-free for longer. Watermelons also contain vitamins C and E that are both considered to be good for the skin. Supports the Nervous System – Watermelons contain potassium that can help in keeping the nervous system fit. It helps in maintaining electrolyte balance in the body as well. Word of Caution – While eating watermelon is great for the body, it is important to understand that portion control is very necessary. Excess of watermelon can cause problems like diarrhea, water intoxication, and liver inflammation.